Recover lost information, repair broken partitions and rebuild damaged and missing file systems in fully automated mode. 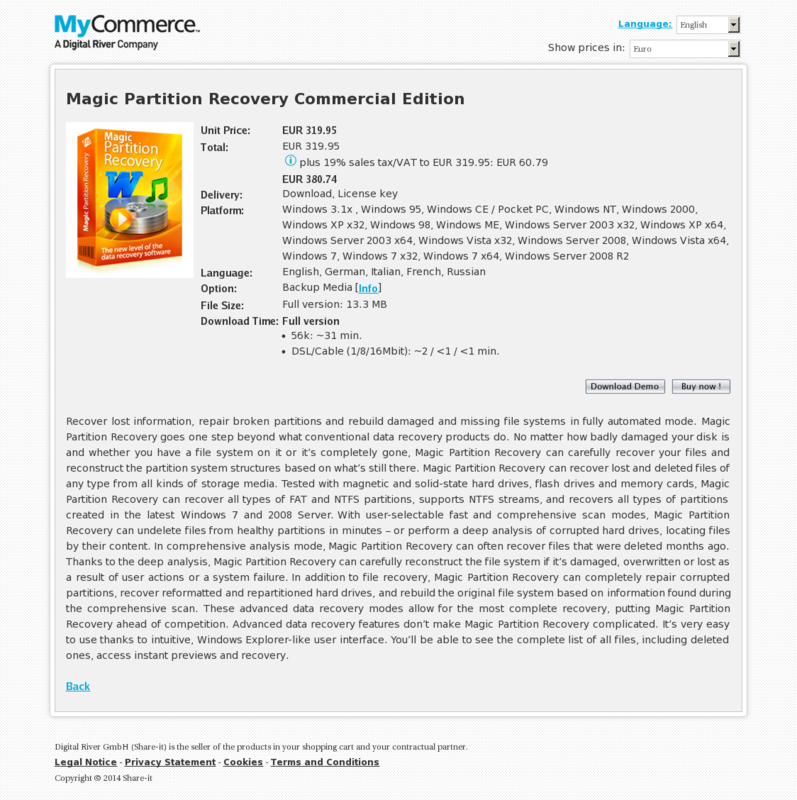 Magic Partition Recovery goes one step beyond what conventional data recovery products do. No matter how badly damaged your disk is and whether you have a file system on it or it’s completely gone, Magic Partition Recovery can carefully recover your files and reconstruct the partition system structures based on what’s still there. Magic Partition Recovery can recover lost and deleted files of any type from all kinds of storage media. Tested with magnetic and solid-state hard drives, flash drives and memory cards, Magic Partition Recovery can recover all types of FAT and NTFS partitions, supports NTFS streams, and recovers all types of partitions created in the latest Windows 7 and 2008 Server. With user-selectable fast and comprehensive scan modes, Magic Partition Recovery can undelete files from healthy partitions in minutes – or perform a deep analysis of corrupted hard drives, locating files by their content. In comprehensive analysis mode, Magic Partition Recovery can often recover files that were deleted months ago. Thanks to the deep analysis, Magic Partition Recovery can carefully reconstruct the file system if it’s damaged, overwritten or lost as a result of user actions or a system failure. In addition to file recovery, Magic Partition Recovery can completely repair corrupted partitions, recover reformatted and repartitioned hard drives, and rebuild the original file system based on information found during the comprehensive scan. These advanced data recovery modes allow for the most complete recovery, putting Magic Partition Recovery ahead of competition. Advanced data recovery features don’t make Magic Partition Recovery complicated. It’s very easy to use thanks to intuitive, Windows Explorer-like user interface. You’ll be able to see the complete list of all files, including deleted ones, access instant previews and recovery.